Sql Server does not (on my knowledge) have in-build Split function. Split function in general on all platforms would have comma-separated string value to be split into individual strings. 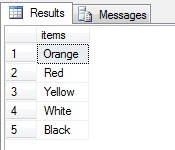 In sql server, the main objective or necessary of the Split function is to convert a comma-separated string value (‘abc,cde,fgh’) into a temp table with each string as rows. The below Split function is Table-valued function which would help us splitting comma-separated (or any other delimiter value) string to individual string. Above Split function can be used to pass parameter to IN clause in sql server.